Colombo: Sri Lanka president Maithripala Sirisena said he was opposed to the efforts being made by the UNP to form a national government. "How ethical is it to establish a national government by enlisting the support of a single MP? I am opposed to this proposal. The people don’t want more ministers and the only reason why some want to establish a national government is to increase the number of ministers." The President added that when the people voted for a unity government in 2015, they had done so in the hope that the country would gain from such an arrangement. A lot was accomplished by the administration, however, the leaders of the unity government did not fulfil the expectations of the people. "The debt crisis is worse now. The problems faced by the people are worse. We were not able to usher in economic development. The people are not well disposed towards the tardy progress on the development front. We must change our education system to suit the 21st century and modernise the economy based on new concepts. Asia will lead the world, in this century, and we must be a part of that process." 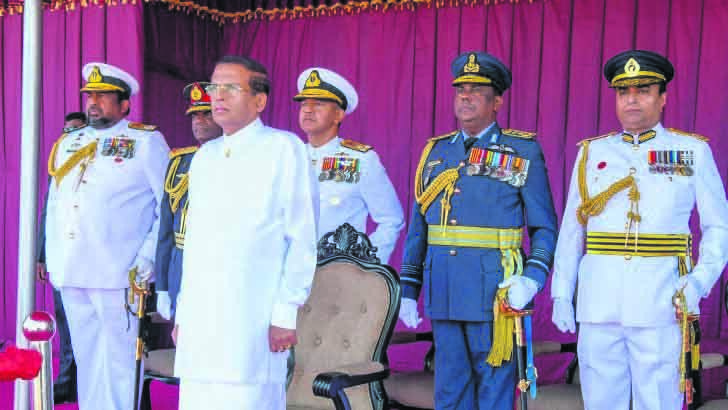 The President also said that Sri Lanka had not been able to evolve a political solution acceptable to all stakeholders though one decade had elapsed since the conclusion of the war. He added that a number of governments had remained focused on finding a solution to the ethnic conflict without paying much heed to the economy. Neither of the issues had been resolved, he added. The President added that the people of the North had been able to live with a great degree of freedom in the last four years. "These people were not able to enjoy freedom during most of the post independence period. We must understand the importance of reconciliation. We must not forget that ambers still lie beneath the ashes." The President also added that international drug traffickers had turned Sri Lanka into one of their main transit hubs. The economic model Sri Lanka had adopted was not sustainable. "While absolute poverty is at 6.7%, most people earn less than Rs. 1,000 a day and this is why comparative poverty is over 50%," he said.